The UPR is a cycle and each stage is an integral part of the process, including the follow-up and implementation phase. With over 1,800 recommendations made to 158 countries on SOGIESC issues, the UPR has helped ensure progress in the protection of the human rights of LGBTI persons. Yet, the UPR mechanism has no formal and mandatory follow-up mechanism which ensures governments fulfil their commitments and promises to implement recommendations. This is where civil society comes in – you play a vital role in ensuring accountability and closing this implementation gap. Since the inception of the UPR, civil society has encouraged governments across the globe to effectively and successfully implement their SOGIESC recommendations. And through this collaboration, we have seen bridges built between civil society and their respective governments. In this important part of the process, you should begin to strategise on how to implement all SOGIESC recommendations received by your government and then share these strategies with various stakeholders – your own government, your national human rights institution, embassies of recommending states, or UN agencies. You can also help your government submit a mid-term report between its reviews which outlines any concrete and targeted steps it has taken to implement its SOGIESC recommendations. If your government is not willing to produce such a report, you can simply submit your own! 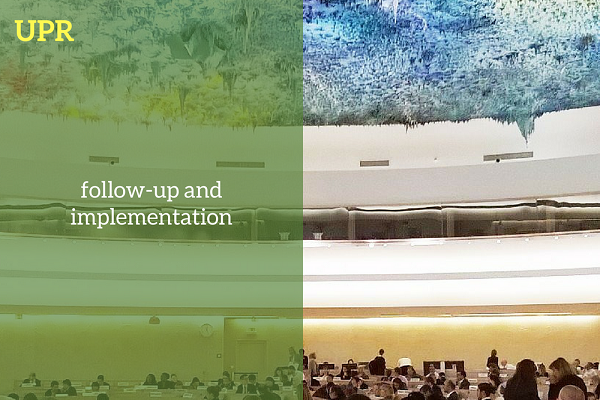 Our SOGIESC UPR Advocacy Toolkit provides a full overview on how civil society can engage with UPR follow-up and implementation. You can find more information and download this resource here. You can find examples of mid-terms reports here: Honduras | China. ILGA is of course here to support you and share advocacy tips and tricks throughout UPR follow-up and implementation. If you have any queries or questions during this phase, please don’t hesitate to reach out to us at upr@ilga.org. Share with us your good practices on follow-up and implementation!